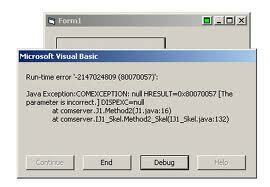 0x80070057 Error is a typical problem involving the Windows Update or Windows Live Messenger mail service. The error message can be an indication that there is an issue with Windows Update, specifically with the “SoftwareDistribution” folder, or if it is from the Windows Live Messenger mail, it can mean that there is a message stuck in the outbox that couldn’t be sent by the mail service. You need to resolve the issues contributing to the error with code 0x80070057 to be able to prevent the error message from appearing and fix your PC. This tutorial will enable you to quickly fix the error. What Causes The 0x80070057 Error? Click Start > Run and type “services.msc” and then click OK.
Right-click on the “Automatic Updates” service and click Stop. Click Start > Run and type “%systemroot%” and then click OK. You will be redirected to Windows root folder. Locate and right-click on the “SoftwareDistribution” folder and then select Rename. Rename the folder as “SoftwareDistribution.old” and press ENTER. Click Start > Run and then type “services.msc” and click OK to open the Services window again. Right-click on “Automatic Updates” service and click Start. This will turn on Automatic Updates again. Click File > Work offline. Click View > Show or hide > Show all messages. Press the DELETE key from your keyboard to delete everything in the Outbox. Close WLMail and then wait for about 10 minutes. Click File > Work offline to disable it again. You can open and close WLMail a couple of times to verify if the error message does not appear again. If the problem is caused by a malware (malicious software) infection, it is essential that you remove the virus from your system or it will go on and further damage your system. To clean out persistent viruses, you need to use legitimate “anti-malware” programs such as XOFTSPY, which can remove all traces of the malware. The registry is a complicated database for all file and program settings, and can be a huge source of 0x80070057 errors in your system. Windows accesses those settings, but often saves them in the wrong way, producing damaged registry keys that lead to the different errors that you are seeing. In order to fix the 0x80070057 errors, you need to clean out the errors inside the registry. You can manually change your registry, which is both tedious and dangerous, or use a ‘registry cleaner’ that can automatically scan and fix broken registry keys detected.